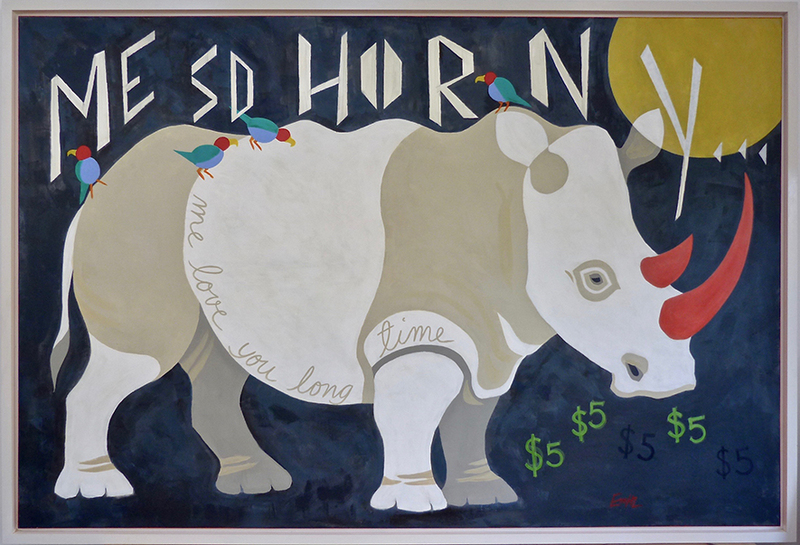 Me So Horny (me love you long time) is the first and largest painting in the Horny Series by Eva. This series highlights the plight of the various rhrinoceros species, which are facing extinction because of humans actions. Phrases from Stanley Kubrick’s film Full Metal Jacket are suggestive of the tough Rhino skin and the big guns poachers use to take them down for the purposes of man’s myths of aphrodisiac effects of Rhino horn. The birds have Dodo-like beaks to suggest the threat and reality of extinction. Size: 180 x 130 cm excluding the simple off-white painted and waxed frame. Limited Edition Prints of 100 in A1, A0 and some extra sizes also available.